Since the beginning of the M1A1 Co-production Program, a joint venture between the governments of the United States and Egypt to produce parts and assemble tank kits for the M1 Abrams Main Battle Tank (MBT), the Egyptian Defense Company Tank Plant has produced around 1,200 M1A1 Abrams Main battle Tank (MBT) in Egypt, Army Recognition https://www.armyrecognition.com reported. The program and the plan for the construction of the co-production facility were advanced by Field Marshal Abd al-Halim Abu Ghazala as a way for Egypt to save money on the procurement of M1 Abrams main battle tanks while concurrently developing its own defense industrial base. Initially, the plan would was estimated to eventually shift 40% of the tank's production to Egypt to save money by taking advantage of the low cost of Egyptian labor. On October 25, 2011, Egypt and the United States celebrated the resumption of co-production of M1A1 Abrams Tanks at a ceremony held at the Egyptian Tank Plant outside of Cairo. The manufacturing of M1A1s in Egypt is a key part of ongoing U.S. support for Egypt’s crucial role as a factor of security and stability in the region. Through this program, the Tank Plant provides jobs for over 2500 Egyptians and supports the capacity of the Egyptian Armed Forces to defend the country. Part of the United States’ $1.3 billion annual commitment to supporting Egypt’s security, the resumption of co-production manufacturing of M1A1 Abrams tanks is the most recent step taken by the U.S. government in partnership with Egypt. American Company, General Dynamics Land Systems began delivering the first of 299 FY90 M1A1 MBTs to U.S. Army in April 1991. Egypt was the first export customer for the M1 MBT who selected the M1A1 variant. The first batch consisted of 555 vehicles and final deliveries under this program were completed in 1998. The first version of the M1 Abrams was armed with one 105mm canon, while the M1A1 is armed with one 120 mm smoothbore M256 armament equipped with a muzzle reference system to measure the bend of the gun tube. The main cannon of the Egyptian M1A1 is also produced license in Egypt. 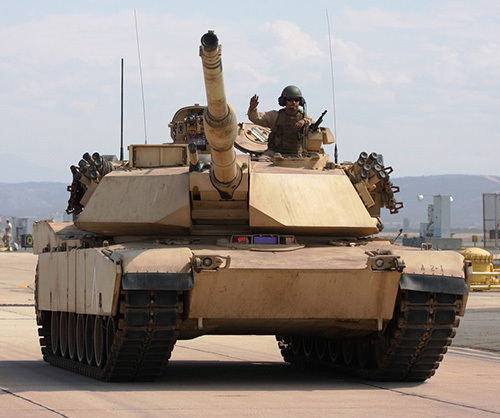 The M1A1 Abrams has a crew of four, including driver, commander, gunner and loader. The driver is seated at the front of the vehicle in the centre while the three other crew members are located in the turret. The commander and gunner are seated on the right of the turret and the loader on the left. The hull and turret of the M1A1 is of advanced armor construction similar to the Chobham armor developed in the UK and gives protection against ATGWs (Anti-Tank Guided Weapons) and standard ammunition. The 120mm of the M1A1 Abrams MBT can fired a various types of ammunition, as the M829A1 APFSDS-T ammunition (kinetic energy round with long rod penetrator, made of depleted uranium, with a muzzle velocity of 1,575 m/sec, and a maximum effective range of 3,500 meters, but engagement ranges approaching 4,000 meters were successfully demonstrated during Operation Desert Storm).